All over the UK including Lincolnshire, are a range of airfields which all played some part in the Second World War. Many sprung up hastily as demand for airbases increased following increased activity over the Skies of Europe. As D-Day approached, so too were airfields developed or modified to take new, bigger aircraft along with troops ready for the invasion.This trip visits two such airfields, both of which can be found in these lower regions of Lincolnshire. The first, RAF Sutton Bridge, served to train gunners before being sent to fight in the Battle of Britain and for bomber crews to hone their skills in defending their aircraft from the attacking Luftwaffe. It became home of the Central Gunnery School, hosting point for several squadrons for short periods before being moved on elsewhere. It is reputed to have been home to a number of ‘famous’ people like Guy Gibson and some of his crew. It remained open for about 30 years on and off but flying ceased in 1946. As the majority of the buildings were temporary, there is virtually no signs of there ever being an airfield here. Awash with poly tunnels and a large-scale potato storage, the only real sign of its existence is a small memorial overlooking the site next to the swing bridge that gives the area its name. Dedicated in September 1993, the memorial, a bent propeller, stand as a reminder of the gallant men who passed through Sutton Bridge on their way to war. Leaving Sutton Bridge along the A17 west, you pass signs to the Holbeach Range. Still used by both British and American pilots, it’s a difficult place to get to and there is little to see unless you have a large telephoto lens. A small ‘control tower’ watches over proceedings, and events are rather hit and miss, so to speak. Flags warn bystanders and dog walkers of action, but it all takes place out of sight of most people. 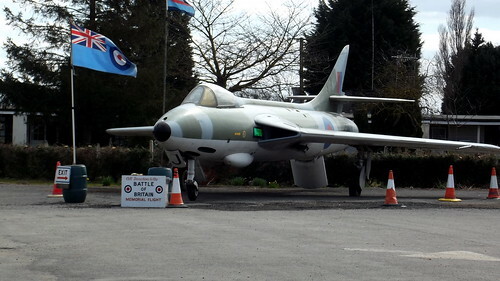 A Hunter – raises money for the Battle of Britain Memorial Flight. Carrying on along the A17 you pass Holbeach and the Anglia Motel which holds a collections of military hardware. Of particular interest is Hunter WT680. Originally from 1429 Squadron ATC at the Defence Test & Evaluation Organisation’s facility at Aberporth, she sits in a colour scheme that apparently she never had in active life. She is in remarkably good condition, considering her location. The owner of the motel, Mr Harold Payne, is a determined supporter of Veterans and organises Normandy trips each year for them. Sadly, their numbers are dwindling and many are now into their 90s. Mr Payne often takes his Armoured Personnel carrier to WWII events and is well-known in the area. He welcomes visits and has through his actions raised a very substantial amount of money for veterans. If passing, I recommend you drop in and have a drink and a chat and offer a small donation. Follow the A151 toward the A1, on the western fringes of Lincolnshire, close to the Leicestershire border, and you come across Twyford Woods, and an airfield that is little known about, yet its part in history is perhaps one of the most important played by any airfield in Britain. Famous battles such as the Normandy invasion, the Ardennes and the crossing of the Rhine all took place because of the events that occurred here, and were it not for this airfield, many may not have been as successful as they were. For the next part of this trail, we head further west to perhaps one of Britain’s best kept secrets – RAF North Witham. RAF North Witham sits quietly amongst the trees of Twyford Woods, a site originally known as Witham Wood, it is now a public space owned and maintained by the U.K.’s Forestry Commission. Originally, North Witham was one of twelve airfields in the Leicestershire cluster intended to be an RAF bomber station for No. 7 Group, however, it was never used operationally by the Royal Air Force, instead like ten others in the area, it was handed over to the US Ninth Air Force and in particular the IX Troop Carrier Command. North Witham’s Tower – now a mere shell. As it was originally designed as a bomber station it was built to the Air Ministry’s class ‘A’ specification, formed around the usual three triangular runways, perimeter track and aircraft hardstands. With construction beginning in the mid-war years 1942/43, its main runway would be 2000 yds long, with the second and third runways 1,400 yds in length and all 50 yds wide. 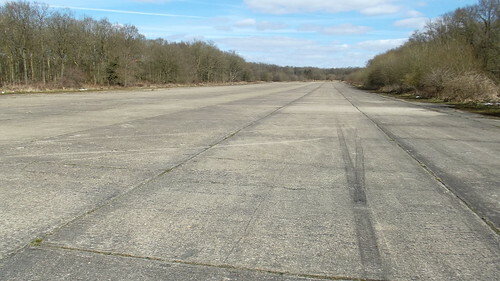 To accommodate the aircraft, 50 ‘spectacle’ style dispersals were built, scattered around the adjoining perimeter track. As a bomber base it had a bomb store, located to the north-eastern side of the airfield, with the admin and technical site to the south-east. One feature of North Witham was its operations block, built to drawing 4891/42, it was larger than most, with ceilings of 14 feet high. Amongst the myriad of rooms were a battery room, cipher office, meteorology room, PBX, traffic office and teleprinter room, all accessed through specially designed air locks. A further feature of this design was the attachment of a Nissen hut to house plant equipment and boiler equipment, a feature not commonly seen at this time. Aircraft maintenance could be carried out in one of two ‘T2’ hangars with additional work space provided by one of six ‘Butler’ hangars. Designed and built by the Butler Manufacturing Company of Kansas, USA, these were supplied in kit form and had to be erected on site by an Engineer Aviation Battalion. 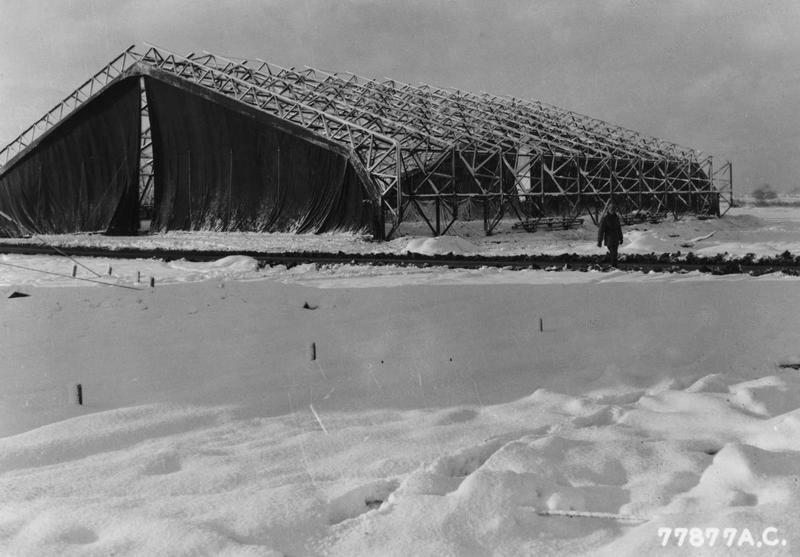 These ‘hangars’ had rigid box section girders over a canvas cladding, and once fully erected, gave a wide 40 ft span. Quite a rare feature, these types of structures were only built in limited numbers during the Second World War and only appeared on American occupied airfields. Post-war however, they were far more commonly used appearing on many American cold-war sites across the UK. The Ninth Air Force was born in 1942 out of the ashes of the V Air Support Command, and then combined with units already located in the England operating under the American Eighth Air Force. Its initial activities focused on the allied push across North Africa followed by the move up into southern Europe through Italy. 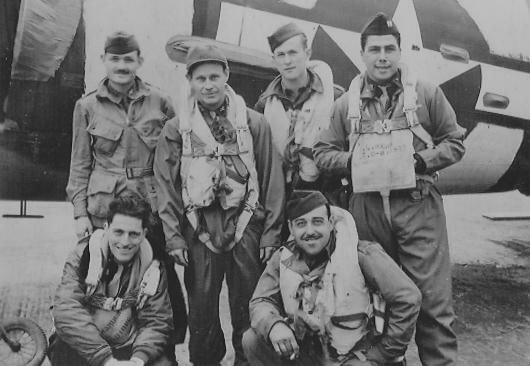 Moving to England in October 1943, it then became the tactical Air Force that would support the Normandy invasion, supplying medium bombers, operating as troop support and providing supply flights. Facilitation of this massive invasion required both a huge backup, and an intricate supply and support network. North Witham would form part of this support network through both repair and maintenance of the troop carrier aircraft that were operated by the Ninth Air Force – primarily the C-47s. 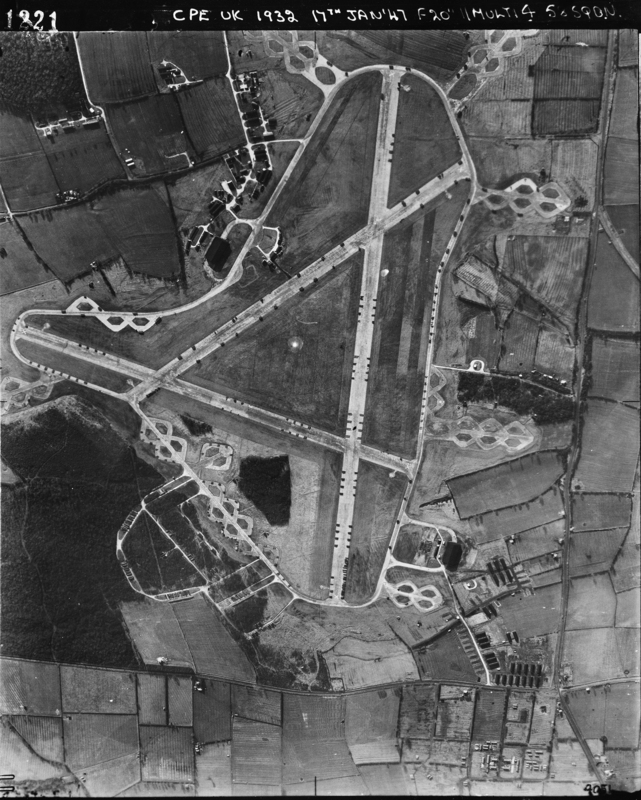 The main group undertaking this role at North Witham was the 1st Tactical Air Depot comprising the 29th and 33rd Air Depot Groups between January and September 1944*1. One of a number of depots, they were once described as the “backbone of Supply for the Army Air Force”, and had a complicated arrangement that encompassed numerous groups across the entire world theatre. For such a large base, North Witham would be operationally ‘underused’, the only unit to fly from here being those of the IX Troop Carrier Command (TCC), who would primarily use C-47 ‘Skytrains’ – an established and true workhorse, and one that would go on to supply many air forces around the world. During the Sicily campaign, it was found that many incoming aircraft were not finding the drop zones as accurately as they should and as a result, paratroops were being widely and thinly scattered. More accurate flying aided by precise target marking was therefore required and so the first Pathfinder School was set up. Part of one of North Witham’s 50 dispersal pans. The IX TCC Pathfinder School (incorporating the 1st, 2nd, 3rd and 4th Pathfinder Squadrons) was formed whilst the TCC was at RAF Cottesmore. Initially having only seven C-47 aircraft, it arrived at North Witham in March 1944. These aircraft were fitted with ‘modern’ Gee radar and navigation equipment, and would be used to train paratroops of the 101st and 82nd Airborne to mark targets prior to the main invasion force arriving. These crack troops would remain at North Witham for short periods before returning to their own designated bases. The idea being a joint venture to land the troops who would then set up a ‘homing’ station using ‘Eureka’ beacons that would connect to ‘Rebecca’ receivers in the aircraft. This would allow flying to near pinpoint accuracy even in poor weather or at night; something that would be employed with relative success in the forthcoming Normandy landings. On arrival at North Witham, the Pathfinders were accommodated in the huts originally provided for the depot’s crews – some 1,250 enlisted men and 75 officers. Many of these displaced men were rehoused in tents along the northern end of the site which only added a further strain to the already rudimentary accommodation that was already in place at the airfield. At its height, North Witham would house upward of 3,700 men in total, a figure that included an RAF detachment of 86 men and large quantities of GIs. Pathfinders of North Witham were the first to leave the UK and enter the Normandy arena. Departing late in the evening of June 5th, men of the 82nd and 101st Airborne climbed aboard their C-47s and departed in to the night sky. North Witham based C-47A*2 ‘#42-93098’ piloted by Lieutenant Colonel Joel Crouch*3, led the way. Nineteen other North Witham aircraft joined Crouch that night, with only one being lost in the entire mission. The Douglas built C-47A-15-DK Skytrain, #42-92845 was lost en route due to mechanical failure – the aircraft ditching in the sea. All the crew and paratroops on-board were believed to have been rescued by the British destroyer HMS Tartar. Pathfinder training continued at North Witham into the summer of 1944, training that included Polish paratroops (1st Independent Polish Airborne Brigade) who would perform a similar role to their American counterparts. These various Pathfinder groups would go on to have long and distinguished careers, supporting the battles at Arnhem, the Ardennes and participating in Operation Varsity – the Allied crossing of the Rhine. As the Allies pushed further into enemy territory, the flying distance from England became too great and so new airfields were either constructed or captured airfields refurbished. The Pathfinder School soon moved away to Hampshire and the maintenance units, needed nearer the front lines, gradually departed to new bases on the continent. September 1944 would see big changes in the Ninth and the knock-on was felt at North Witham. Firstly, the IX TCC transferred from the Ninth AF to the First Allied Airborne Army, and as a result, the Air Depot title was changed to IX Troop Carrier Service Wing (Provisional), which was re-assigned to aid and supply the new Troop Carrier Groups (TCG) now based in France. To accomplish this new role, groups often used borrowed or war-weary C-47s, C-46 (Commandos) or C-109s (converted B-24 Liberators) to fulfil their role. Secondly, the Pathfinder School was re-designated IX Troop Carrier Pathfinder Group (Provisional) and they moved away from North Witham to their new base at Chalgrove near Oxford. 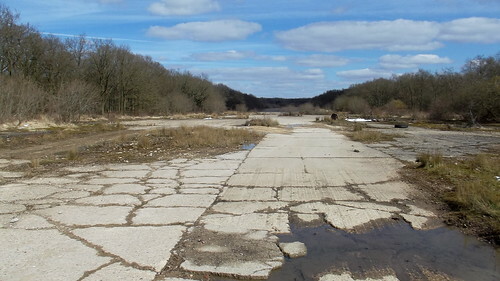 Now much quieter, life otherwise carried on at North Witham, but gradually the UK-based maintenance and repair work slowed down, and before long its fate was sealed and the airfield began the long wind-down that many of these unique places suffered. By the war’s end the last American personnel had pulled out and the site was handed back to the RAF’s 40 Group who, after using it for a brief spell as a maintenance depot themselves, placed it under care and maintenance. 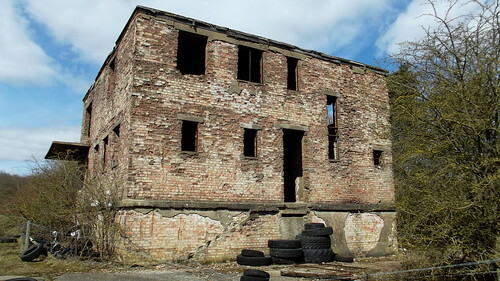 It was used as a munitions and hardware store until 1948, and then finally, in 1956, it was closed by the Ministry and the site sold two years later. 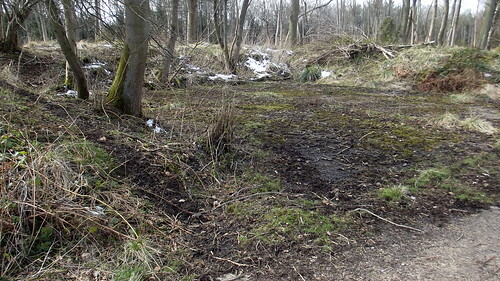 The site, intact as it was, was returned to the Forestry Commission who planted a range of new tress around the site, covering the vast areas of grass. The technical area was developed into a small industrial unit and perhaps most sadly the watch office left to decay and fall apart. Today the three runways and perimeter track still exist almost in their entirety, and remarkably, in generally good condition. Largely overgrown with weeds and small trees, the remainder is well hidden obscuring what little there is in the way of buildings – most being demolished and the remains left piled up where they stood. However, a T2 hangar is now used on the industrial estate and the watch office still stands tucked away amongst the trees and undergrowth. This area is a favourite place for dog walkers, and because of its runways, it is accessible for prams and pushchairs. Whilst here, I spoke to quite a few people, remarkably none of them knew of the site’s historical significance let alone the office’s existence! Today the watch office remains open to the elements. Surrounded by used tyres and in constant threat of the impending industrial complex over the fence, its future is uncertain. Access stairs have been removed, but an entrance has been made by piling tyres up to the door – presumably by those wishing to enter and ‘explore’ further. Little evidence of its history can be seen from the outside, even the rendering has been removed, and so, any possible personal links with the past are more than likely now gone. The view of the main runway from outside the tower. Returning back to the main public entrance along the perimeter track, a number of dispersal pens can be found; overgrown but relatively intact, they are a further sign that even here, war was never very far away. North Witham was one of those ‘backroom boys’ whose contribution, whilst extremely important, is little known about. The work carried out here not only helped to maintain a strong and reliable fighting force, but one that spearheaded the frontal invasion of Normandy. It served as a cold and perhaps uncomfortable home to many brave troops, many of whom took the fight direct to Nazi Germany. Standing here today, it is quiet and strangely surreal – you can almost hear the roar of engines. Looking along its enormous runways you get an eerie feeling – how many troops also stood here, spending their last few hours in this quiet place. Looking around now, it is difficult to imagine the immense work that went on here, the gathering of equipment as preparations were made for the big push into Normandy on that famous June night. North Witham is truly a remarkable place, hidden away amongst the trees as a giant time capsule, a monument to those who lived, worked and died during that turbulent time in 1944-45. After leaving North Witham, we return to the main A1 road and head south. Any journey here can not avoid briefly mentioning RAF Wittering, its Harrier still standing proudly outside the main gate. All went quiet here following the Government cutbacks of December 2010, but flying has now returned in the form of Grob Trainers – a small reprieve for this historic site. Wittering can seen later in Trail 37. Another view along the main runway. Sadly in May 2015, Twyford Woods was the scene of a large illegal rave, over 1000 people attended the event where a number of arrests were made in the violent altercations that took place*4. A sad day that would turn the souls of those who sacrificed themselves for the freedom we take for granted so very easily today. *2 C-47A #42-93098 itself was later lost whilst flying with the 439th Troop Carrier Group (TCG) on September 18th 1944, whilst flying in support of Operation ‘Market Garden‘ in Holland. *3 Superb footage of Crouch and his crew as they depart from North Witham is available on-line here, it also shows the Watch Tower in its former glory. *4 A report of the event is available on the BBC News website. A website dedicated to RAF Sutton Bridge can be found here. Hi Paul, thank you so much for those kind and encouraging words! This really has been a passion of mine for a long time and always surprised me how many people feel the same way that I do. The project is enormous and will probably never reach it’s real conclusion, even now thoughts are of revisits to see parts missed, updates or changes over the last year or so. The infrastructure of the various airforces was/is enormous and I would love to include certainly some of the more important places, where major decisions or even construction took place. Your contribution (pictures or comments) are more than welcome and I would’ve only too pleased to include them on the site. Emailing them is probably best. I have not read the books you mention and will certainly look out for them. Thank you once again, please do continue to read the pages and comment, and I look forward to any contributions you may wish to have included. Thank you for commenting, I am glad you enjoyed it. A very moving place and worthy of a visit if you are anyway near the area. There is a campaign to save the tower, I hope it succeeds!